Arman Ali was appointed as Executive Director of National Centre for Promotion of Employment for Disabled People (NCPEDP). He will succeed Javed Abidi and take over his new role in October 2018. Arman has played pivotal role in bringing disability sector together in North East by forming network of organisations from seven states. He has been head of Shishu Sarothi – Centre for Rehabilitation & Training for Multiple Disability since 2009. Headquartered in New Delhi, NCPEDP is India’s only cross-disability advocacy organisation working towards empowerment of persons with disabilities. New Rs. 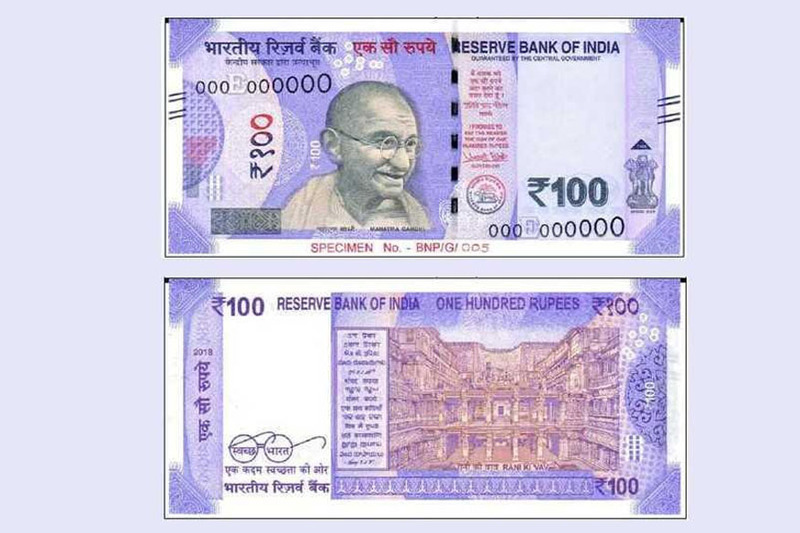 100 denomination banknotes in lavender colour will be issued in Mahatma Gandhi (New) Series by Reserve Bank of India (RBI). The old Rs 100 notes in the earlier series will also continue to be legal tender along with new notes. The front side of new Rs. 100 note depicts Mahatma Gandhi’s face and back side features motif of “RANI KI VAV”, highlighting the country’s cultural heritage. Rani ki Vav, a UNESCO world heritage stepwel site in Patan, Gujarat built in memory the 11th century king Bhima. R. Rao Satellite Centre (URSC), ISRO’s nodal satellites division has signed separate contracts with three vendors- Alpha Design Technologies P Ltd and its six consortium members; defence public enterprise Bharat Electronics Ltd (BEL) and Tata Advanced Systems Ltd, Hyderabad -to outsource Spacecraft Assembly Integration and Testing (AIT) activities. The outsourcing is part of capacity-building initiatives undertaken by U R Rao Satellite Centre to promote participation of Indian industry from space craft subsystems to spacecraft assembly, integration and testing. URSC (formerly known as ISRO Satellite Centre) is nodal centre of ISRO for design, development, fabrication and testing of all Indian made satellites established in 1972 based in Bangalore, Karnataka. Prevention of Corruption (Amendment) Bill, 2013 to amend various provisions of Prevention of Corruption Act (PCA), 1988 has been passed by Rajya Sabha. The amendment to PCA, 1988 was necessitated to its review existing provisions to bring it in line with United Nations Convention against Corruption (UNCAC) as agreed by India. The Bill introduces offence of “giving a bribe” as direct offence. It redefines provisions related to criminal misconduct to only cover two types of offences viz. illicit enrichment and fraudulent misappropriation of property. Union External Affairs Minister Sushma Swaraj hosted the 10th edition of Delhi Dialogue (DD X) in New Delhi with the theme of “Strengthening India-ASEAN Maritime Cooperation”. This was the first major event organised after ASEAN-India Commemorative Summit, which was held in New Delhi in January 2018. Delhi Dialogue is premier annual event to discuss politico-security, economic and socio-cultural engagement between India and the Association of Southeast Asian Nations (ASEAN). Lok Sabha has passed Fugitive Economic Offenders Bill, 2018 that aims to curb practice of evading criminal prosecution by economic offenders fleeing from country to evade clutches Indian law by remaining outside jurisdiction of Indian courts. The bill’s implementation is expected to restore law and order, as the fugitive economic offenders would be forced to return to India to face trial for their offences. The bill would also help the banks and other financial institutions to achieve higher recovery from financial defaults committed by such fugitive economic offenders and thus improving the financial health of such institutions. The bill provides for the creation of a “Special Court” under the Prevention of Money-laundering Act, 2002 to declare a person as a Fugitive Economic Offender. The National Mission for Clean Ganga (NMCG) organised the “Ganga Vriksharopan Abhiyan” in five main Ganga basin states – Uttarakhand, Uttar Pradesh, Bihar, Jharkhand and West Bengal. This week-long afforestation drive was organised during July 9 to July 15, 2018 as “Shubharambh Saptah”. The campaign was initiated as part of the Forest Interventions in Ganga (FIG) component of Namami Gange Programme. It was aimed at bringing greater awareness among people and other stakeholders regarding the importance of afforestation for the task of Ganga Rejuvenation. India and Japan held the fourth round of Maritime Affairs Dialogue in New Delhi on July 19, 2018. During the dialogue, key issues related to the Indo-Pacific region and maritime securities were discussed. The Indian delegation at the dialogue was led by Pankaj Sharma, Joint Secretary (Disarmament and International Security Affairs) in the External Affairs Ministry, while the Japanese side was led by Ambassador Kansuke Nagaoka, Policy Planning and International Security Policy in the Ministry of Foreign Affairs. The Maritime Affairs dialogue was followed by the seventh round of the India-Japan Bilateral Consultations on Disarmament, Non-Proliferation and Export Control. The Student Police Cadet (SPC) Programme will be launched nationally on July 21, 2018 by Union Home Minister Rajnath Singh. The SPC programme seeks to build a bridge between the Police and the larger community through school students by inculcating values and ethics in them through classes in school and outside. The programme would lay a greater emphasis on field demonstrations and hands on learning of the functioning of the police through visits to women police stations, child protection homes including NGOs, traffic police and fire brigade stations. The Centre has released an amount worth Rs 67 crores to the states for the implementation of the programme. 1. Who is appointed as Executive Director of National Centre for Promotion of Employment for Disabled People (NCPEDP)? 2. When was U.R. Rao Satellite Centre (URSC) established? 3. Which act is to be amended by the Prevention of Corruption (Amendment) Bill, 2013? 4. Who hosted the 10th edition of Delhi Dialogue (DD X) in New Delhi? 5. Which among the following state is not a part of Ganga Vriksharopan Abhiyan? 8. Who launched the Student Police Cadet (SPC) Programme?